Robert Weible, State Historian of New York and Chief Curator of the New York State Museum will provide the keynote address at the National Abolition Hall of Fame and Museum (NAHOF) annual dinner at 4:45 p.m. Saturday, October 20 in the Hall of Presidents at Colgate University in Hamilton NY. Irene’s flooding in August 2011 prevented Penny Colman from getting to Peterboro to discuss her new book Elizabeth Cady Stanton and Susan B. Anthony: A Friendship That Changed the World. Colman has arranged with the Gerrit Smith Estate National Historic Landmark to discuss and sign her work at 2 p.m. on Saturday, August 25, 2012. Colman will highlight the friendship between Stanton and her cousin Gerrit Smith of Peterboro, who she once called “the sage of Peterboro.” Stanton spent summers in Peterboro in the 1830s and it was during these visits that she met Henry Brewster Stanton and he proposed marriage to her. 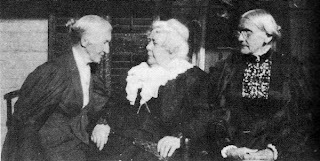 Smith’s daughter Elizabeth and Stanton were close friends with each other and with Anthony. In the spring of 1851 Elizabeth Cady Stanton and Susan B. Anthony were introduced to each other on a street corner in Seneca Falls NY. Immediately drawn to each other, they formed an everlasting and legendary friendship. Together, they challenged entrenched beliefs, customs, and laws that oppressed women and spearheaded the fight to gain legal rights, including the right to vote, despite fierce opposition, daunting conditions, scandalous entanglements, and betrayal by their friends and allies. Penny Colman weaves commentary, events, quotations, and personalities into her book Elizabeth Cady Stanton and Susan B. Anthony: A Friendship That Changed the World and into her program on the two famous women’s rights activists. Colman writes about illustrious, but not typically well-known, women and a wide range of significant and intriguing topics in her books for all ages: Rosie the Riveter: Women Working on the Home Front in World War II, Corpses, and Thanksgiving: The True Story. She has taught nonfiction literature and creative writing at colleges and universities, including Ohio State University, Queens College, the City University of New York and Teachers College, Columbia University. She lives in Englewood, New Jersey. The following day Sunday, August 26, Norman K. Dann PhD. shares his research for his upcoming book Cousins of Reform on the relationship between Elizabeth Cady Stanton and Gerrit Smith. Respected researcher and author of Practical Dreamer: Gerrit Smith and the Crusade for Social Reform, Dann became interested in the lively and stimulating relationship between two of the principal leaders of 19th Century reform in America. Dann delighted and admired Stanton’s pluck in standing strong in her convictions – even when her admired older cousin challenged her. Gerrit Smith’s reform efforts are also part of a new interpretive exhibition at the Gerrit Smith Estate National Historic Landmark installed in mid July. People coming to the Equality Weekend programs are encouraged to come before and stay after the presentations in order to view the new exhibits. This is a family event to celebrate the history of freedom seekers who came to Peterboro with the aid of abolitionist Gerrit Smith. The morning program begins with a reception and refreshments, tent meeting, annual group photo, procession to Peterboro Cemetery, wreath ceremony to honor Gerrit Smith and a memorial dedication of a stone for a freedom seeker who is buried in the Peterboro Cemetery. The afternoon program will include a tour of the estate, games and contests for children, and a talk by guest speaker Hugh Humphreys at the Smithfield Community Center on Pleasant Valley Road in Peterboro at 2:00 PM. Humphreys’ presentation titled “Dr. King and the Mighty Stream of Righteousness- a Journey from Peterboro to Montgomery.&#8221 will explore the history and influences of early reform on the Civil Rights movement. The 2012 celebration marks the 3rd year the event has been revived in Peterboro from its early beginnings in the 19th century. A $5 donation at admission is suggested and the event is open to the public. For more information: 315-280-8828 and info@gerritsmith.orgMorning registration will take place at the Gerrit Smith Estate at 5304 Oxbow Road in Peterboro, NY at 10:00 AM. Parking is free. No lunch will be served, but there will be a break for families to picnic. The Gerrit Smith Estate National Historic Landmark (GSENHL) is on the state and national Underground Railroad trails. The GSENHL is open in 2012 on Saturdays and Sundays from 1 – 5 pm from May 19 to September 23, by appointment, and for special events. Admission is $3 for adults and free for students. For more information: 315-280-8828 or www.gerritsmith.org. 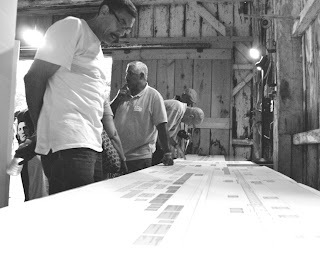 Photo: Jim Corpin, one of the organizers of the 21st C. Peterboro Emancipation Days examines a family genealogy chart brought to the 2011 Peterboro Emancipation Day. Photo provided. Stewards for the Gerrit Smith Estate National Historic Landmark (GSENHL) in Peterboro will announce plans for the 2012 Peterboro Heritage events at the annual Gerrit Smith birthday party on Saturday, March 3, 2012 at the Smithfield Community Center, 5255 Pleasant Valley Road in Peterboro (Madison County). The doors will open at 1:00 pm followed by program announcements and updates at 1:30 p.m.
Norman K. Dann PhD, professor emeritus Morrisville State College and Smith biographer will present Gerrit Smith and the Civil War at 2 p.m. Dann’s program will be followed by birthday refreshments. Many programs have presented Smith’s significant role in igniting the Civil War through his radical abolition activities. This program will address more specifically what Smith was doing in 1862 during the second year of the Civil War, and the connection of the Preliminary Emancipation Proclamation to Smith. The program is open for the public with a three dollar admission for adults, and free for students and 2012 GSENHL Stewards. The annual party kicks off the observance of the Sesquicentennial of the Civil War. During New York Heritage Weekend, the Earlville Opera House and the 20th Annual Peterboro Civil War Weekend will present John Brown’s Ghost: From Madison County to Harpers Ferry at 7:30 pm Saturday, May 19 in Madison Hall on Scenic NYS Route 20 in Morrisville. Hugh C. Humphreys will welcome the audience with a brief description of Madison County’s role in the Civil War. Madison County Historian Matthew Urtz will show some faces of persons from Madison County who served in the Civil War, and letters from and to soldiers will be read. Performers Greg Artzner and Terry Leonino, well known for their musical renditions of Civil War songs, (especially the history of John Brown) will provide a preview for an expanded Civil War concert Four Seasons, Four Years ~ the Civil War: a Musical Journey, at the Earlville Opera House on Friday, June 8. Eleven New York musicians have assembled to perform Four Seasons for the four years of the Civil War sesquicentennial. The 20th Annual Peterboro Civil War Weekend opens at 10 am on Saturday, June 9 and closes at 4 pm on Sunday June 10. The 77th NY Regimental Balladeers will present Hard Times Come Again No More: America’s Heart Songs at 8 pm on Saturday night. Civil War military and domestic encampments with sutlers, exhibits, Civil War roundtables, programs, skirmishes, entertainment, book-signings, children’s games, musical programs, reenactor units, town displays, and lectures have expanded to include newly developed historical interpretations. Dr. Milton C. Sernett presents Terrible Swift Sword and Madison County Historian Matthew Urtz shows Madison County Faces in the Civil War. The Smithfield Volunteer Fire Department will barbeque chicken on Saturday and the Peterboro United Methodist Church will flip pancakes on Sunday morning. July 1 Dr. David Anderson will present Frederick Douglass’ reasons for his opposition for speaking about freedom on the Fourth of July. Emancipation Day on Saturday, August 4 is followed Sunday with Hometown Day, Family Day of Croquet, and an afternoon program on the Peter and William Still family by Leslie Gist Still. On Equality Day Weekend (August 25 and 26) two programs featuring Elizabeth Cady Stanton will be presented. Saturday evening, August 27 at 7 p.m. Hugh C. Humphreys will give an illustrated talk on the Great Cazenovia Convention of 1850. Ted Jackson speaks on his great grandfather abolitionist James Caleb Jackson on Saturday, September 8. The summer season closes with the annual Elizabeth Smith Miller In the Kitchen Bloomer Tea on Sunday, September 23. The National Abolition Hall of Fame and Museum commemoration ceremonies for 2011 inductees Abby Kelley Foster, Jermain Wesley Loguen, and George Gavin Ritchie will be held at Colgate University on October 19 and 20, with tours on Sunday, the 21st in Peterboro and Syracuse. Saturday evening, November 24 Joanne Shenandoah will pay tribute in concert to her ancestor Chief Skenandoah and his friend Peter Smith at Madison Hall in Morrisville. Events for 2012 Peterboro Heritage are made possible, in part, with funds from the New York State Council on the Arts Decentralization Grant Program, a State Agency, and the Cultural Resources Council, a Regional Arts Council. The Peterboro Mercantile, a community heritage shop, the Gerrit Smith Estate National Historic Landmark (GSENHL), and the National Abolition Hall of Fame and Museum (NAHOF) are open Saturdays and Sundays from 1-5 pm beginning Saturday, May 19 and ending Sunday September 23, for special events and tours, and by appointment. The GSENHL is a site on the National Park Service Network to Freedom (national Underground Railroad trail) and both sites are on the Heritage NY Underground Railroad Trail, a program of the NYS Office of Parks, Recreation, and Historic Preservation. Adult admission is three dollars. Students and 2012 Stewards are free. The projects are recruiting volunteers for the 2012 season. For more information and to check updates on programs: www.gerritsmith.org, www.abolitionhof.org, 315-366-8101, 315-280-8828. Photo: A member of the 77th NY Regimental Balladeers plays on the green during Civil War Weekend. As Black History month commences, Peterboro, NY (in Madison County) is finalizing plans for 2012 programs that explore and explain the 19th Century history of African-Americans in the hamlet and its significance to the history of our nation. On January 31st, the anniversary date of the Thirteenth Amendment that abolished slavery, the National Abolition Hall of Fame and Museum Traveling Abolition Museum exhibit was transported from Case Library at Colgate University to Memorial Library at SUNY Cortland for Black History Month. The exhibit had been installed at Colgate for Martin Luther King Jr. commemorations at the college. Milton C. Sernett Ph.D. professor emeritus Syracuse University developed the text and visuals for the traveling museum that cover the history of American Abolition from slavery in the Colonial era to the Civil War. Dr. Sernett, a member of the Cabinet of Freedom for the National Abolition Hall of Fame and Museum (NAHOF) in Peterboro, will also be presenting at SUNY Cortland on the Abolition Crusade in Upstate New York. Robert Djed Snead, a Jermain Wesley Loguen reenactor who performed at Loguen’s NAHOF induction in October 2011, will perform and present Loguen at SUNY Cortland. For the same month The History Center in Ithaca will be hosting the John Brown Lives! Timbuctoo exhibit during Black History Month. Timbuctoo explains Gerrit Smith’s plan to gift 3000 African-American men with 40 acres of land. The 20th Annual Peterboro Civil War Weekend June 9 and 10, 2012 will join in the nation’s commemoration of the Sesquicentennial of the Civil War. Military battles were not waged on Peterboro soil, but Peterboro was the center of human rights activities that waged war against slavery, and those activities led to the ignition of the Civil War. Dr. Sernett will present The Terrible Swift Sword: Abolitionists and the Civil War. Also, Alice Keesey Mecoy, will return to NAHOF to share insights into her great, great, grandfather John Brown. NAHOF will exhibit a copy of the Preliminary Emancipation Proclamation gifted by the New York State library. Lincoln presented his draft of the Preliminary Emancipation Proclamation to his Cabinet on September 22, 1862. The New York State Museum will open an exhibit on September 22, 2012 about the Proclamation which was briefly owned by Gerrit Smith of Peterboro. 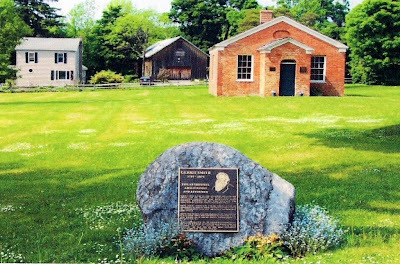 Sunday, July 1 at 2 p.m. at the Smithfield Community Center in Peterboro Dr. David Anderson of the Akwaaba Program at Nazareth College will portray Frederick Douglass’ in the delivery of Douglass’ famous Fifth of July speech. Saturday, August 4 the third annual 21st C. Emancipation Day will be held in Peterboro. On Sunday, August 5 Lesley Still Gist will detail the famous Underground Railroad work of William Still and his reunion with his long lost brother Peter Gist who came to Peterboro to seek help from Gerrit Smith. Saturday, August 18 at 7 p.m. Hugh Humphreys will present on the great Cazenovia protest against the 1850 Fugitive Slave Law. The National Abolition Hall of Fame and Museum Commemorations October 20, 2012 at Colgate University include the unveiling of Jermain Wesley Loguen’s banner for the Hall of Fame, as well as that of Abby Kelley Foster and George Gavin Ritchie for their risk-laden pursuit of freedom for slaves. Loguen’s afternoon symposium will be presented by Robert Djed Snead, and Snead will also re-enact Loguen during the evening celebrations. Heritage New York Underground Railroad Trail and National Park Service National Historic Landmark exhibits on the Underground Railroad, abolition, and African-Americans of Peterboro are open from 1 – 5 pm Saturdays and Sundays May – September at the Gerrit Smith Estate National Historic Landmark and the National Abolition Hall of Fame and Museum. For more information refer to www.sca-peterboro.org, www.AbolitionHoF.org or 315-366-8101 as the season progresses. 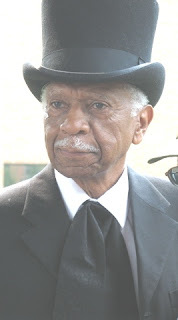 Photo: Robert Djed Snead portrays Syracuse Underground Railroad station conductor Jermain Wesley Loguen at Loguen’s October 2011 Induction to the National Abolition Hall of Fame and Museum in Peterboro. 160 years ago on October 1st, a captured fugitive slave named Jerry was freed by a mob of Syracuse citizens. For seven years after that date Central New York abolitionists celebrated the Jerry Rescue with an event that commemorated its importance. In 1859 Gerrit Smith responded to the request of the Jerry Rescue Committee for him to speak with a refusal because people had not maintained the high level of commitment to abolition that the Jerry Rescue had demonstrated. On October 1, 2011, exactly 160 years after the Jerry Rescue, John M. Rudy will present &#8220The Jerry Level&#8221: Gerrit Smith and the Memory of the Jerry Rescue at 2 p.m. Saturday, October 1, 2011 at the Gerrit Smith Estate National Historic Landmark, 4543 Peterboro Road, Peterboro NY 13134. October 1st, 1851, events in Downtown Syracuse drastically altered the course of the lives of countless Central New Yorkers. As abolitionists battered down the door to a Syracuse police station and freed the fugitive slave Jerry Henry, they embarked on a journey which would span the course of the next decade. The Jerry Rescue was a catalyst for Upstate’s abolition activity from 1851 until the dawn of the Civil War. Among those who turned the freeing of one man on Clinton Square in Syracuse into mass action were Gerrit Smith and Jermain Loguen. Smith advocated living life to the &#8220Jerry Level&#8221 regarding the need for radical action. 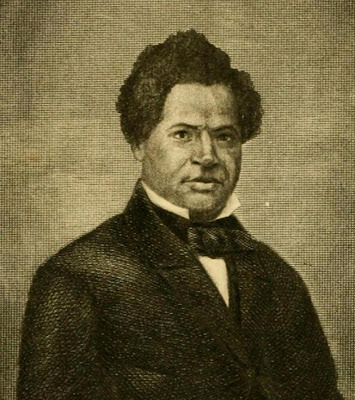 Loguen took the Jerry Rescue as inspiration to become more active in the Underground Railroad in Central New York. Throughout the 1850s the two men grew more radical every year until, by 1859, civil war seemed inevitable. On the event’s 160th anniversary, historian John Rudy will share some of the interesting tidbits of research that he unearthed during his thesis preparations, investigate Central New York in the turbulent 1850s, and recognize the enduring memory of the Jerry Rescue. Rudy’s thesis centers around four personalities who had connections to the Rescue. Daniel Webster, in his May 1851 speech in Syracuse which challenged the abolition community, leads off the study. The next chapter centers on Jermain Loguen, Syracuse’s &#8220King&#8221 of the Underground Railroad. Third is a discussion of Gerrit Smith’s disillusionment with the Upstate abolition community over the course of the 1850s, and his eventual alliance with John Brown. The final chapter discusses Samuel May and the &#8220death&#8221 of the Jerry Rescue spirit in Syracuse at the coming of the war. It seems that the abolition world, for about ten years, revolved around Syracuse and its personalities &#8211 Smith being key among that community of thinkers. 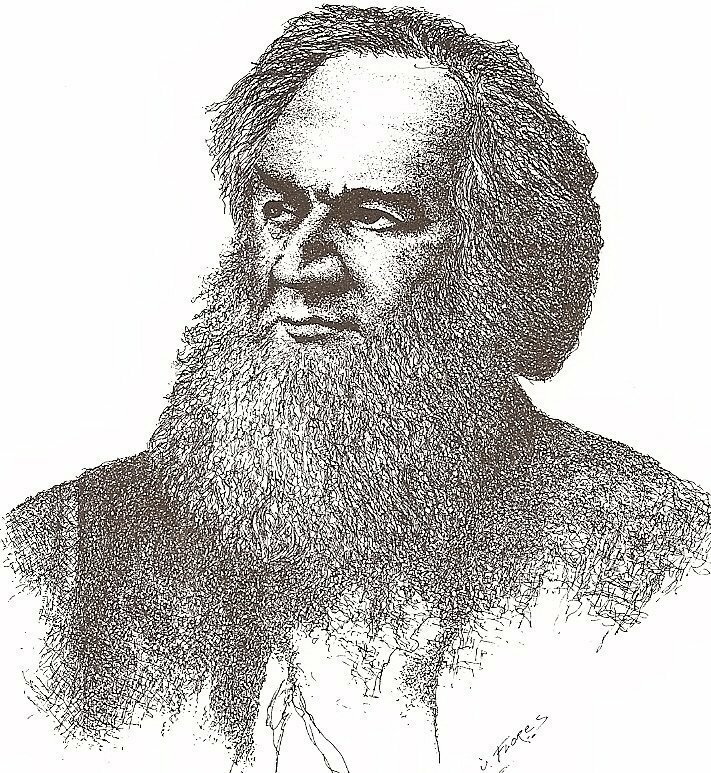 Gerrit Smith was one of the first five abolitionists to be inducted into the National Abolition Hall of Fame and Museum in 2005. Jermain Wesley Loguen will be inducted into the Hall of Fame on Saturday, October 22 in ceremonies at Colgate University. A native of Pompey in Onondaga County, John Rudy has been studying the history of Upstate New York’s abolition community since 2005. John holds a Masters in Applied History from Shippensburg University and a Bachelors in History, with a minor in Civil War Era Studies from Gettysburg College. John currently lives in Gettysburg and works with the National Park Service’s Interpretive Development Program in Harpers Ferry, WV, creating training materials for park rangers across the entire park system. The public is encouraged to attend the program at the Gerrit Smith Estate National Historic Landmark, 4543 Peterboro Road / 5304 Oxbow Road, Peterboro NY. Admission is two dollars. Students are free. This program is one of a series of programs provided by the Stewards for the Gerrit Smith Estate National Historic Landmark during 2011 and partially supported by a PACE grant from the Central New York Community Foundation. The Gerrit Smith Estate National Historic Landmark and the National Abolition Hall of Fame and Museum are open from 1 – 5 p.m. on Saturdays and Sundays from May 14 to October 23 in 2011. Admission to each site is two dollars. Stewards and students are free. For more information: Gerrit Smith Estate National Historic Landmark, 4543 Peterboro Road, Peterboro NY 13134-0006 www.gerritsmith.org 315-684-3262 and National Abolition Hall of Fame and Museum, 5255 Pleasant Valley Road, Peterboro NY 13134-0055 www.AbolitionHoF.org, 315-684-3262. Photo: Jermain Wesley Loguen of Syracuse was one of the primaries in the rescue of Jerry McHenry from a jail in Syracuse on October 1, 1851.